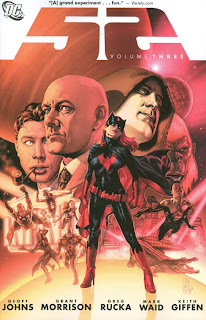 So far, the third collection of DC's weekly series 52 is my favorite (beating even the super-cool scene in time-traveler Rip Hunter's headquarters from Volume One). Certainly this edition of 52 was the most emotional, and the all-too-real prolonged death sequence of the character The Question showed well the power of a weekly real-time comics medium. I also appreciated how this volume offered major movement for each of the character sets, from the space heroes to hero Steel's niece Natasha Irons, Booster Gold, Black Adam, and the mad scientists. Volume Two had movement, but the end -- with the dual non-cliffhangers of Renee and the Question going to Nanda Parbat for the first time, and Osiris meeting his crocodile friend Sobek -- felt like the series was meandering; likely this is a difference between reading 52 weekly versus the trades. Volume Three, however, features strong final chapters where all the protagonists face challenges, and it sets up Volume Four far better than Volume Two set up Volume Three. Volume Three has a bunch of surprises, but enough so that they're starting to become predictable. Booster, as we now know, has been hiding in plain sight all this time, pretending to be another hero. It appeared as though Natasha was getting the better of her enemy Lex Luthor, but we learn in the end that Luthor's henchman Hannibal had replaced Natasha's friend and trapped her. We know scientist Will Magnus is pretending to be crazy when he isn't, so it's just as likely that Elongated Man Ralph Dibny hasn't really become a drunk; my guess is that it's not alcohol he's been drinking all this time. The one drawback in 52 is that it still seems the writers are trying to do too much. There's a cameo by the Batman family in this volume that might be very compelling, if it didn't fly by so quickly. Without context, it just seems like a a cameo for cameo's sake, and it's hard to believe Bruce Wayne is really giving up the mantle of the Bat again. Similarly, the space heroes story reads pretty much like hash, with the forgettable Lady Styx villain and a confusing Green Lantern/Emerald Eye plot only serving to move the heroes from one place to another. With more pages, these might have been fleshed out; as is, they distract (but not too terribly) from the otherwise better plots. 52 has been a fantastic ride, and it's hard to believe it's almost over. No doubt there's still some surprises and controversy left to come, and despite some failings I'm still eager for Volume Four.